Cyclists and triathletes can begin logging next season's training today with the newest generation of training diary from VeloPress. Updated with feedback from coaches and athletes, The Cyclist's Training Diary and The Triathlete's Training Diary make it easier than ever to gain insights into performance. The VeloPress Training Diaries are the best way for cyclists and triathletes to consolidate training data, track progress, redefine goals throughout the season, and record the way their bodies respond from day to day. Designed as companions to Joe Friel's Training Bibles, the new editions make space for every training detail, with charts to organize race results and fitness indicators, physiological test results, and more. With a training log that's personalized, portable, and easy to review and update, athletes can gain new insights into their performance. Endurance athletes of all ages and ability levels invest countless hours in tough rides and workouts so they can race farther and faster from year to year. Whether they work with a coach or train independently, cyclists and triathletes rely on their training log to tell them when to push harder and when to back off. With all of the recent technological advancements in training, it is more important than ever to have a place to consolidate training data and track progress. Designed with collaboration from cyclists and coaches, this next generation of training diaries will make it easier than ever to record and interpret every component of cycling and multisport training. Coach Joe Friel gives athletes a thorough introduction to the essential details of training and keeping a log. For athletes who are designing their own annual training schedule, he provides a guide to planning the entire season. 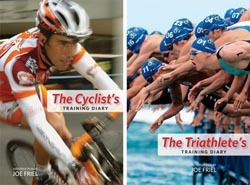 The Cyclist's Training Diary and The Triathlete's Training Diary take training seriously. Athletes can be confident that they will be better prepared for competition and have insight to the progress made along the way. Paperback with wire-o binding. VeloPress is an endurance sports publisher focusing on the sports of cycling and triathlon, with training books that help both serious athletes and beginners build skills and fitness. VeloPress also publishes historical and biographical books that take a closer look at the celebrated athletes and personalities in our sports. VeloPress authors are trusted experts in training, gear, maintenance, nutrition, and the history of our sports. VeloPress is the book publishing division of Inside Communications, Inc., publisher of VeloNews and Inside Triathlon magazines.